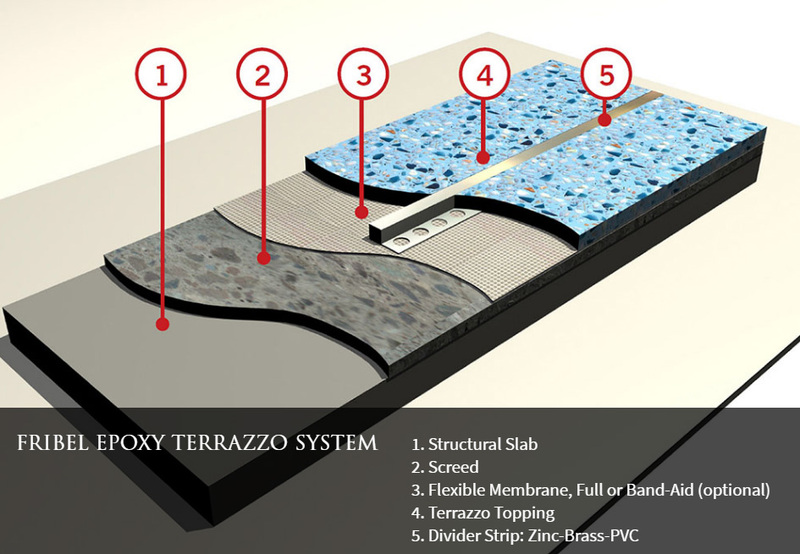 The chips, or aggregates used in terrazzo, are capable of being ground to multiple sizes and taking a good polish. Chips are usually marble and onyx ground to a specific size. Other materials which may be incorporated to enhance the visual impact upon grinding include, but are not limited to: mother of pearl, colored glass, colored resinous synthetics, semi precious stones, and lustrous metal fragments. Chips are graded by number according to size in conformity with industry standards. Withstands 16ft/lbs without cracking, delaminating or chopping. 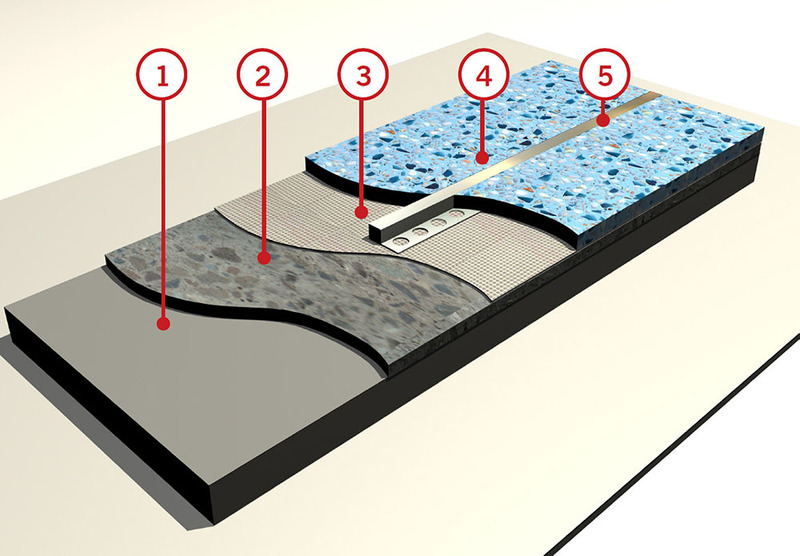 1 – C241 Abrasion Resistance of Stone Subjected to Foot Traffic. 2 – D56 Flash Point by Tag Closed Tester. 3 – D41 Flash Point by Tag Closed Tester. 4 – D635 Rate of Burning and/or Extent and Time of Burning of Self-supporting Plastics in an Horizontal Position. 5 – D638 Tensile Properties of Plastics. 6 – D695 Compressive Properties of Rigid Plastics. 7 – D696 Coefficient of Linear Thermal Expansion of Plastics. 8 – D1308 Affects of Household Chemicals on Clear and Pigmented Organic Finishes. 9 – D2240 Rubber Properties – Durometer Hardness. Hardness: Grade “D” Following As Per ASTM D2240. Resistance To Traction: 207 Kg/Cm2 As Per ASTM D638. Chemical Resistance: As Per ASTM D1308 After 7 Days In Liquid, Epoxy Is Resistant TOils, Minerals, Isoprophanol, Ethanol, Hydraulic Acid @ 10%, Sulfuric Acid @ 30%, Acetic Acid @5%, Detergents @ 0,025%, Soap Solutions @ 1%, Hydroxide Of Sodium @ 10% and Distilled Water. Flammability Test: Self-extinguishing, Class A Pass ASTM D635. Thermal Coeffi cient of Linear Expansion: 4.5 x 10-6 per C° per thermal range of – 24C° through 60 C° as per ASTM D696 NFPA. 253 Flooring Radiant Panel Tests: 1.02 watts/cm2 as per ASTM E-648 Coefficient of Attrition: > 0.60, without seal with dry floor.